Nirvana played a homecoming show in Seattle on 11th September 1992, their first since breaking through with 1991’s Nevermind. 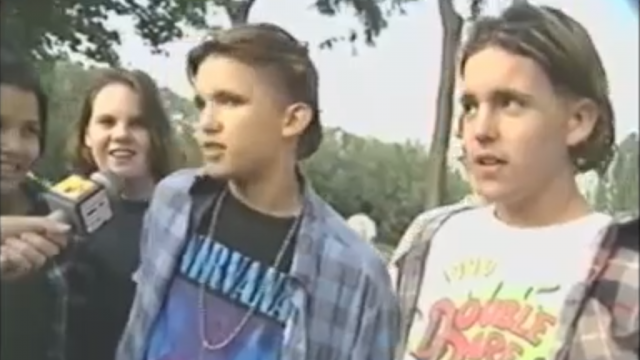 On that very day, MTV News interviewed Nirvana’s friends, family and fans prior to the show, and the previously unseen ’90s clip has now been released. The footage proves that whilst most Seattle residents were super-excited by Nirvana’s rise to fame, some also called for the band to continue playing smaller venues, whilst others called for the focus to be put onto lesser-known Seattle bands. “Seattle is a lot more than just Nirvana and Pearl Jam,” a young woman says in the clip. Another more outspoken fan of Nirvana tells MTV News that the band haven’t ‘sold out’ because of Nevermind‘s commerical success, and points the finger at those who only took to Kurt Cobain, Dave Grohl and Krist Novoselic after they made it in the big leagues. “I don’t think they’ve sold out. I think the stupid creepy alternative f***ots that come here are a bunch of shitheads,” the young fan can be heard saying. Besides speaking with excited locals, MTV News also spoke with someone claiming to be the cousin of the late Kurt Cobain, as well as Cobain’s mother Wendy O’Connor, who discussed the mixed emotions she and her family were experiencing as they watched Kurt’s band rise to fame. According to MTV, 15,000 fans packed the Seattle Center Coliseum for Nirvana’s 1992 homecoming gig, which was supported by Helmet and Fitz of Depression. Complete with a Hacky Sack circle, flannel shirts and ’90s kids freaking out when they realise that they’re on MTV, the 11-minute time capsule clip is available in all its glory below.